Is remote killing easier than traditional combat? 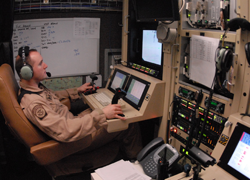 One argument against the unmanned drones that the United States currently uses in combat in Iraq and Afghanistan and against terrorist targets in Pakistan, Yemen and Somalia is that because the drone pilot sits thousands of miles away from combat, operating the drone remotely, killing is easier — more akin to a video game than real combat. The argument goes that if killing is easier, the soldiers will be more prone to use lethal force. Proponents argue that this kind of killing isn’t easier because the remote soldier isn’t in the combat theatre where soldiers are in an environment where killing is the norm and they have comrades with whom to process the experience. Drone pilots kill during the day, go home after work and coach their kids soccer games. The theater of war, this argument goes, engenders battle hardened soldiers who become more acclimated to combat and killing. David Muir, Inside the Drone War: On the Ground and in the Virtual Cockpit With America’s New Lethal Spy, ABC News, Jan. 12, 2010, http://abcnews.go.com/WN/inside-predator-drones-game-changing-technology-war-afghanistan/story?id=9543587. To my knowledge, there is no study on whether remote killing is harder or easier than traditional combat tactics. Any thoughts out there? What an interesting debate! My initial feeling is that both of these arguments are basically true. There is no doubt that remote operators are more emotionally removed than their counterparts on the field, and it also seems to be the case that an individual constantly surrounded by killing and death becomes hardened to that reality. For me, the question is less about whether killing is emotionally “easier” for one group or the other than it is about which configuration allows for the most reasoned decision about whether such killing is appropriate. To that end, I think that because remote operation is less physically and psychologically stressful, remote operators are in a better position to make a reasoned decision on the use of force than their traditional counterparts. I hope you are right, Jon. One fear is that video game players who have been killing for fun will simply transition over to real killing with a similar lack of restraint. Another aspect of remote piloting is the fact that the pilot is not alone in making the decision. From my understanding, there can be (and usually are) multiple individuals overseeing the operation. Sometimes the pilot needs the approval of multiple individuals before firing. Even if the pilot did not need the approval of other individuals, the fact that they are witnessing the kill-decision probably makes the pilot more cautious. Good point. The entire episode is usually recorded as well which is a powerful tool to prevent wanton killing. The hard part of delivering air to ground weapons isn’t killing the bad guys. That’s why you’re there (whether in person or virtually). While there is some stress associated, it’s not the driver. 1. Collateral Damage: Killing innocents is bad. It’s how we train, it’s how we fight. 2. Not killing bad guys that end up killing good guys: Very bad, keeps you up at night. It’s also not terribly uncommon. There’s a decision tree associated with weapons release. Sometimes you don’t have enough information until the good guys are taking fire. 3. Blue on Blue: You killed good guys. Can ruin you forever. These are the main stress producers, and they’re real regardless of where you’re sitting when you’re pulling the trigger. I have seen some writers suggest that killing bad guys is not problematic when the soldier is in theatre and warfare is the context in which they operate. However, drones are different scenario. Here, the soldier or airman who is using lethal force isn’t in a combat environment surrounded by a support environment but rather a civilian one. Hence the suggestion that for drone pilots and bombadiers that killing may be psychologically difficult. This issue becomes a topic of debate in all military combat operations. Being a product of the Vietnam War, it was “assumed” that B52 pilots were somehow immune to guilt and PTSD issues because they were “removed” from the impact zones. Many of my friends who were fortunate to return home were not immune to these issues. It may have come at a later period in their lives, but it did surface at some point and at some level. I would caution anyone who assumes that remote warfare is somehow akin to video games. Death is death regardless of its delivery method or degree of separation. Yes, some individuals have a built-in resistance to the after-effects but for most, the delivery of death is still a difficult and enduring challenge. While a 10 year old may seem detached during a kill spree on a video game, when the game is turned off, there is no post reflection on the consequences of the video death(s). On the contrary, the older (and presumed more mature) person who actually kills someone via remote technology, will, in time, reflect on the events of that mission. I for one hope that it is in fact the outcome for most, otherwise we have a VERY BIG and looming problem ahead of us all. One final comment – the most compelling issue in “remote killing” is the absence of a threat and thus fear. When the event is personal (one on one) the element of fear is a primary influence in the ability to deliver death. It’s the flight or fight syndrome. From the comfortable confines of a UAV control van there is no fear, no threat only the realization that someone else is going to die today by my hand(or button). However, as I said earlier, at the end of the day/mission, death is death and with the delivery of death comes an awesome responsibility and with it a lot of post reflection. Allen – You summarized well my general thoughts on the subject. I particularly liked the last paragraph concerning the absence of threat and fear in the use of remote technology. As a soldier, I am very skeptical of the notion that people directly engaged in combat operations are less inclined to kill than remote pilots/decision-makers in targeting process. To me this appears to be a patently false premise. The decision to use lethal force is much easier when you and your fellow soldiers’ lives are on the line. It really is fight or flight. Obviously soldiers are trained to fight in that scenario and in those few seconds, when the fog of war is still thick, they will have to make a decision. Odds are great that they will fall back on their training and use lethal force. Remote pilots have much of that fog, and all of that fear, lifted. Simply put – they are operating in a clearer environment that may lend to more reasoned judgment. Also, as other commenters have pointed out, the decision to use lethal force with drones does not entirely lie with the pilot (at least within military operations – I don’t have the knowledge to speak for other government agencies). He or she is not a one-man/woman show. There is a targeting process that involves layers of intra-military decision-making and approval. While I have not worked directly with UAV operations and any experience I’ve had with them has been purely incidental, my time in the military has brought me in contact with people who have. Those who have been in engaged in BOTH direct ground combat and in the decision to use lethal force with drones (and therefore have a basis for comparison) have said that killing isn’t any easier just because they are removed from the battlefield. Their decisions have laid just as heavy on their conscience and sometimes they have seen the results of their decisions firsthand. They have not lost their humanity just because they are sitting behind a computer screen at the time of the strike. Well put. For me what has surfaced and then validated from this discussion is the opportunity the UAV/Recon community has before it. The “fog” of war has one very significant aspect – the inability for the combatant to fully understand his/her immediate threat environment. What the goal should be is to idealy prevent or at the least, diminish the density of that “fog”. This is the opportunity before the UAV community. It is a very exciting time with tremendous opportunity. One concern is that while arguably UAV operations at the moment are conducted in a very controlled environment with many checks and balances in place, the pace of development of robotic weapons and our growing comfort with them will inevitably lead to situations where lethal remote weapons are operated in less controlled environments, more akin to typical squadron scenario without the checks and in a more reactive battlefield situation. The use of remotely operated lethal force in that situation is a better apples to apples comparison. A fascinating article, Tessa. The wide proliferation of drones, and potential unsavory side-effects, begs the question: what do we do about it? An argument I heard advanced drew an analogy between landmines and drones. Landmines were cheap, effective, and widely-deployed weapons. They were deployed in many places, both on and off the battlefield. However, the international community began to see the collateral damage from wanton landmine use. This, in turn, helped spur the international campaign to ban landmines. Drones, like landmines, are cheap and relatively easy to operate. As the article suggests, the US will soon have to face a world of drones, some in situations we’d rather not have to. The question then becomes: do drones provide such a benefit that we’re willing to live with the consequences? The New York Institute for the Humanities at NYU presents a screening of two short films followed by a conversation with the film makers, NYIH director Lawrence Weschler, and an expert panel about the legality of drone attacks, the possible culpability of distant pilots acting under military orders, and the ethics and aesthetics of the representation of death, killing, and the otherwise unthinkable. This event is free and open to public on a first-come, first-in basis (no tickets or reservations). For further details and schedule updates, visit http://nyihumanities.org/event/eichmann-drones, or contact The New York Institute for the Humanities: 212.998.2101; nyih.info@nyu.edu. I read your arguments and insights with much interest, thank you. While I didn’t found yet any more extensive studies on psychological issues either, you may find these bits helpful. In case the hyperlinks weren’t any more active, I could send you the files. Thanks for all the links. Very helpful. In particular, Mary Ellen O’Connell refers to Grossman’s “On killing”, as she already did in her “Unlawful Killing with Combat Drones. A Case Study of Pakistan, 2004-2009″. Please be mindful the Grossman’s book has a 2nd edition from 2010. I am wondering whether any inquiry on psychological effects of drones took place in any country in the framework of the legal review of new means of warfare demanded by IHL (in particular Article 36 of the Additional Protocol I to Geneva Conventions)…? Fault Lines looks at how robots have become the fastest growing arm of development in the US military and what that means to the way America fights its wars. Together with a colleague, I gave an introductory presentation on legal aspects of drone technology at a conference in Warsaw two weeks ago. If anybody was interested, contact me at j.kowalewski@gmail.com . I envisage to study the issues more. Thanks for an informative site. Where else could I get that type of info written in such a perfect manner? I have a mission that I’m just now working on, and I’ve been at the look out for such info.